The Scorpion was a surprise hit last year, but it wasn't without it's own problems. From some users reporting issues with stock darts, to it's rate of fire, and ranges. But today Dart Zone released a preview of it's new line of products for 2016, and it may be a game changer for the company. "Nerf compatible", or at least "Nerf elite streamline size" means that their products hopefully won't experience the issues they have in the past. A standard universal dart size is a huge step forward for hobbyists, especially at games that have a dart pool or rental system. On field savaging becomes easier, and there's always the potential for a better dart from someone other than Hasbro. 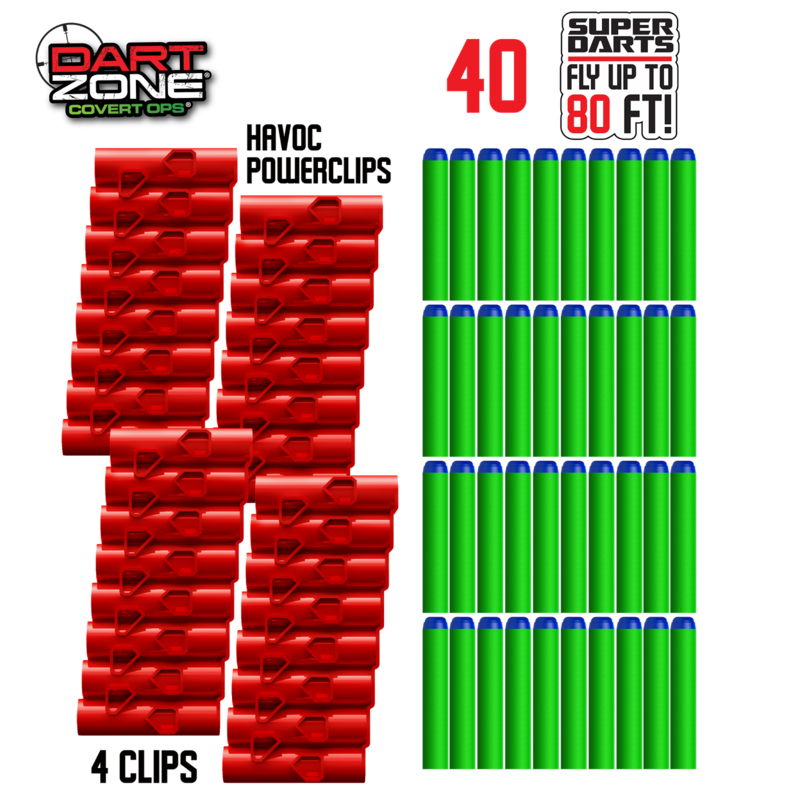 Dart Zone announced that they will sell 100 dart refills for $24.99 on their website which will feature dart refills, clips, ammo belts, and other accessories. Look at this bad boy, 40 darts, 30 seconds. So aside from new darts what else do we have to look forward to? Well, as we mentioned earlier, the Scorpion was a surprise hit last year, and Dart Zone has decided to up the ante this year. 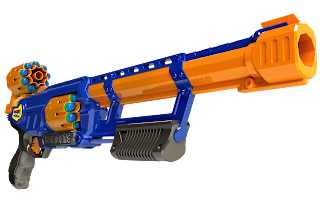 Their flagship blaster, the Enforcer will feature "Superdart" compatibility, a 50% speed increase, and will fire up to 80 feet. It's also bigger than it's older brother, boasting a 40 dart belt and the box claiming 40 darts in under 30 seconds. Bascially if you enjoyed the Scorpion, you'll likely enjoy this beast. And for $29.99 we'll see if it redefines "bang for your buck" the way the Scorpion did last year. 6 AA batteries not included. 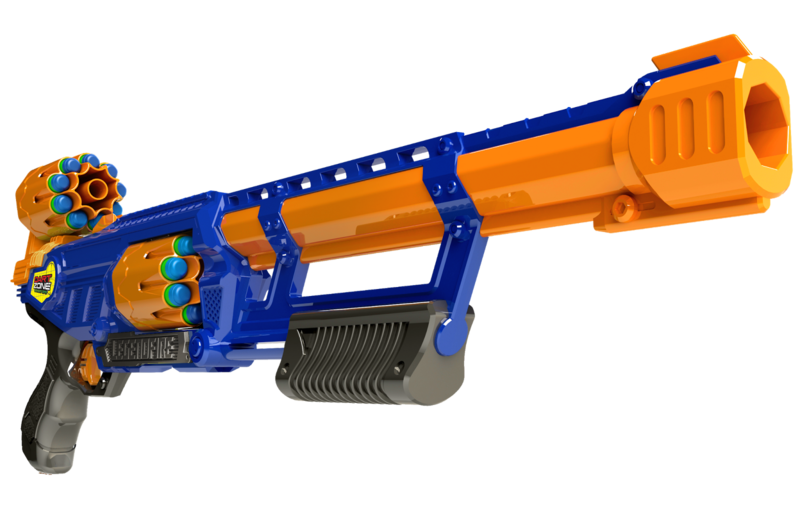 Following in the belt fed blaster category is the Powerbolt....in blue. 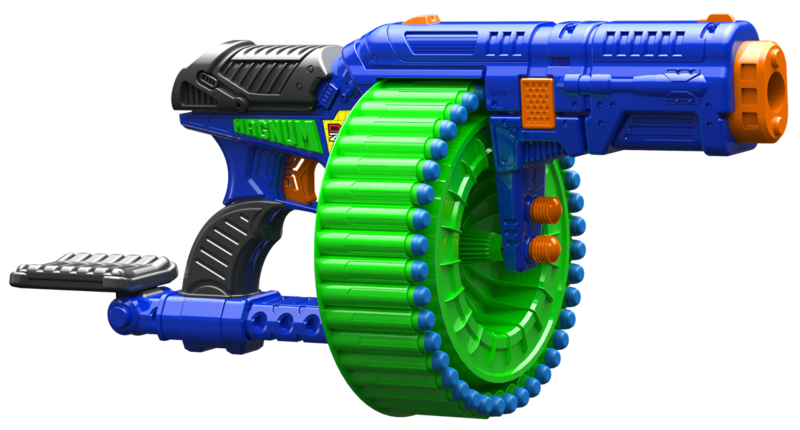 Ok, this isn't anything new, but apparently many blasters will be featured with a blue makeover that will be available at Target. Also, it will be packaged with new Superdarts and boasts 80ft ranges. The new (still slamfire only) Powerbolt will come with 2 belts and 36 darts.One thing to note, especially if you plan on buying extra ammo belts from their web store, the Scorpion belts will not be compatible, so be careful what you buy. Is that... a forearm rest? Moving from belts to drums we have the Magnum Superdrum. This aptly named 40 dart drum will, like all these new models use new Superdarts and fire up to 80 ft. (Seriously we're going to stop saying this. If you made it this far, just expect that everything else listed will also feature these unless otherwise stated. Which it isn't. Because THEY ALL DO.) 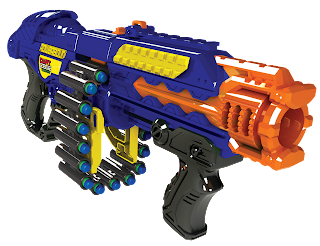 Unlike the Powerbolt the Magnum will feature both trigger fire and slamfire. 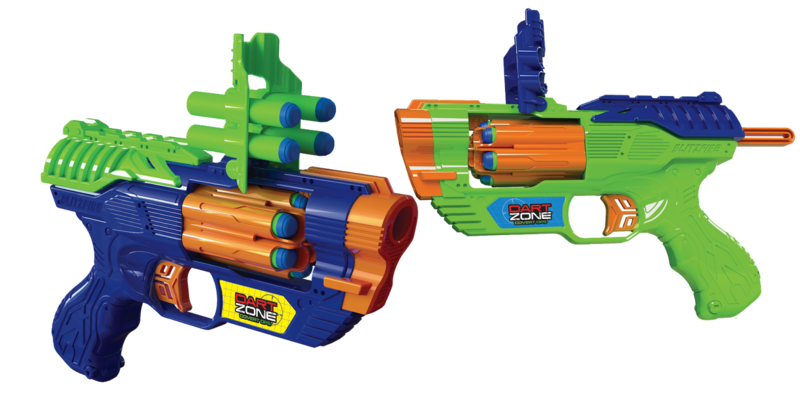 It's a lot of blaster for $19.99, if not a bit unwieldy. 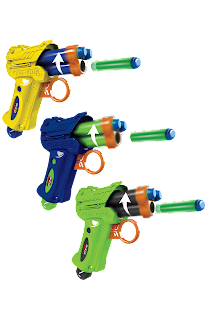 The Legendfire has got to be one of the coolest looking blasters in this line. It's "long rifle" design and interchangeable 9 round cylinder (called a cartridge by DZ) make this an amazing looking blaster on field, or at a convention. 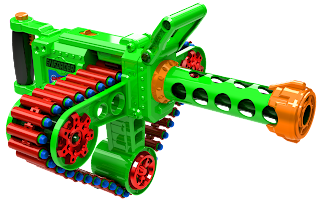 The ability to open the blaster like a barrel break, replace the entire cartridge while an extra (included) cartridge is stored on the back is a great design feature. Underbarrel priming and a $14.99 price tag make this a force to be reckoned with. Or it would.... If the trigger worked. 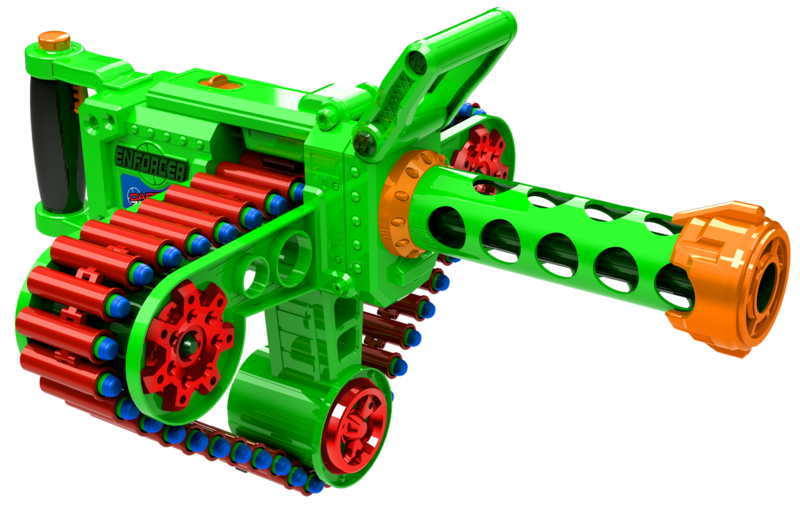 That's right, this is another slamfire only blaster. It HAS a trigger, but for looks only. It's completely non functional. This would have easily been our most wanted blaster from this line, and we'd gladly take the price hike to increase it's functionality. 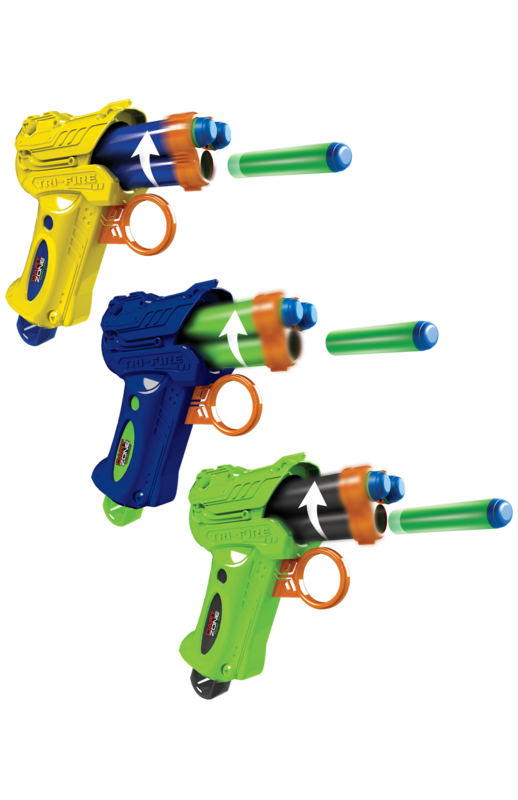 Returning to old models with new features, Dart Zone announced the Quad 4-pack. This $19.99 blaster pack will feature 2 Renegades and 2 Phantoms with the aforementioned improvements. While it may seem like you get a lot for your money, both these blasters have a relatively low capacity and rate of fire. So unless you're buying these for cosplay or very young fans, we'd reccomend skipping this one. The pop-up sights hold darts. 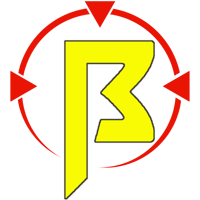 On the subject of multi blaster packs, the Blitzfire 2-pack will be available exclusively at Target. These two Maverick-ish blasters are somewhat standard six shot cylinder rotating blasters. Nothing really special here. While you get two for $14.99, your money would likely be better spent on a Strongarm (which features slamfire) or a Hammershot (which features a single hand hammer prime). Pretty much a pack of multiple blasters for the price of just one of the competition or even their own base models should be a clue that these "value packs" don't really offer much in the way of quality. Finally the Dart Zone closed out with a clip fed blaster: the Havoc. Aside from conjuring memories of the long forgotten Tek Recon brand, this clip fed blaster tries to be daring but looks a bit underwhelming. This Model will fall under the "Adventure Force" line (as opposed to Covert Ops") and will be available at Walmart. It features 2 "powerclips" that each hold 8 darts. It's $9.99 price tag is attractive, but there are a few points to note on this blaster. First off it primes on the side, specifically the left hand side. Unlike the Doominator (which allows you to change the side you prime from), the Havoc is exclusively for right handed users. 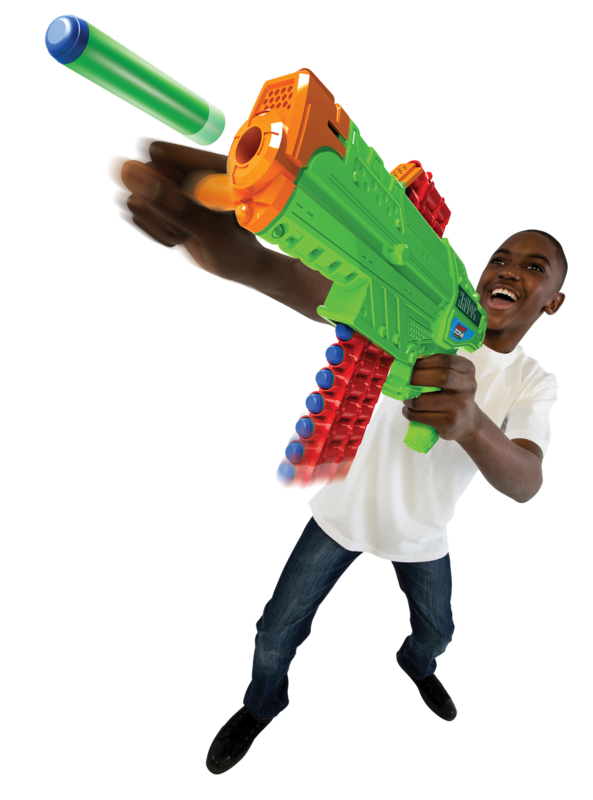 The clip moves through the blaster starting from the bottom up through the top. Unfotunately this makes any sort of sighting a bit difficult the further into the the clip you get, as it obstructs your view. 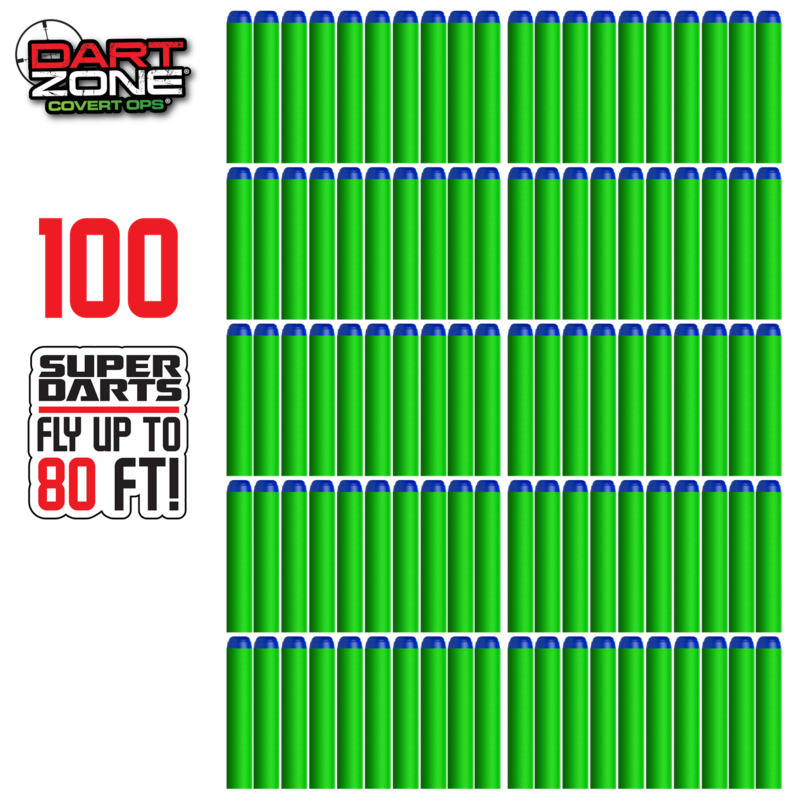 No word yet if there will be larger clip capacities, but the DZ website will feature a four pack of these with 40 Superdarts for $14.99. So that's it for Dart Zone 2016. Big thanks to DZ for inviting us to their webinar. We're excited to see how their darts stack up against Hasbro's offerings for the price. We're really diggin' the green and blue. Thanks to your write up review on this line! Muxh appreciated. 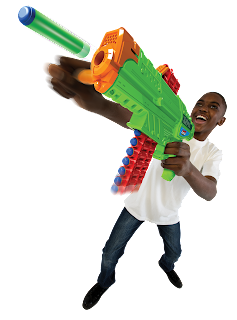 As a father who have never owned any of these toy guns i must agree with others that this article was the BEST one i could find. I Bought my daughter the scorpion and legendfire. Thankyou again for reviews very helpful.